Thanks. I unclick the definition script box, paste this code, but nothing happens. When I just play the animation with "play animation" it plays, but I need to stop it. The function should be in a definition type script. 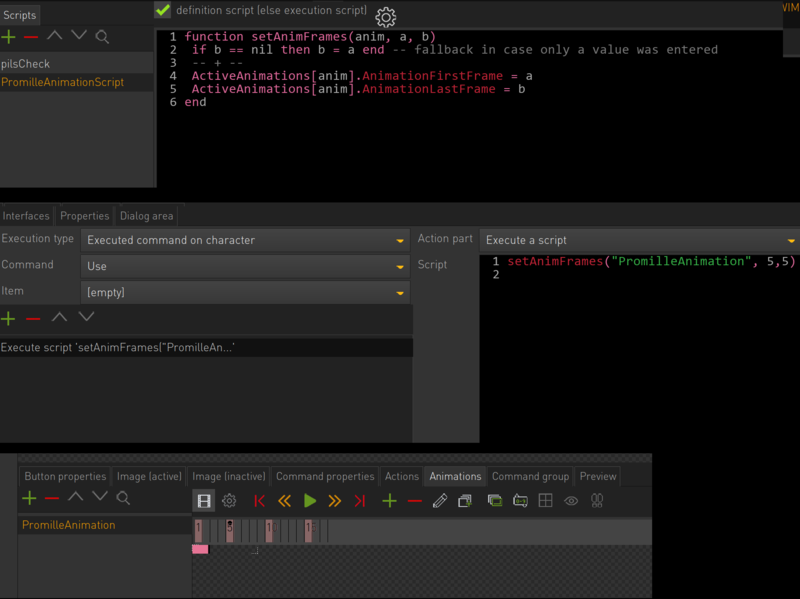 Definition scripts are run at game launch, thus they are good for declaring functions & variables. Execution scripts (definition unticked) will only work when you manually call the script via the call script action part. These should only be used when functions aren't needed, & even then should only really be used if the script you write has a lot of lines of code or you want to call it multiple times throughout the game. For the most part you should only really be using definition type scripts & execute a script action parts. I am sorry, guys. I guess I am still doing something wrong. Here is the screenshot from all the parts regarding my Animation. Can you see, what's wrong? This should show the frame 5 from the animation, right? It doesn't. How should the animation settings be? 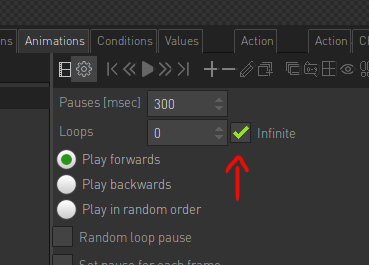 Loop, Set pause etc? Pauses don't matter that much when only showing one frame. Thanks. Weird - nothing happens. When I "Play animation" with Action Part it works perfectly, but not with the script. I will try to set everything again, but obviously I am doing something wrong. Eh? are you trying to start/play the animation with my setAnimFrames() function? that's not what it is for, at all. It's for forcing an already playing animation to loop between a set range of frames. Play the animation or assign the animation as the default animation of the scene object via the properties section of the scene object. Execute the function at any point while the animation is already playing.